What Bird Seed? What Bird Feeder?... Who me? 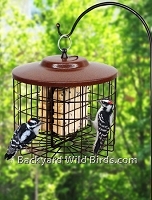 There are many ways to have a Squirrel Proof Bird Feeder. You too can have an effective squirrel stopper. 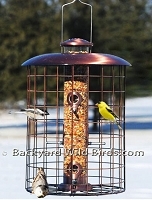 Squirrel proof methods for Wild Bird Feeder systems are available for the bird feeder and bird feeder pole. 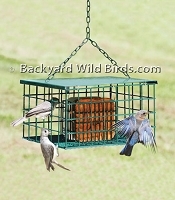 The hanging bird feeder uses a large squirrel baffle above or a cage bird feeder. 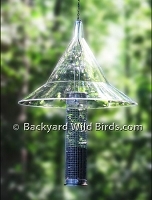 A Bird Feeder Pole can use a cylinder squirrel baffle or a cone squirrel baffle to be a great squirrel stopper. 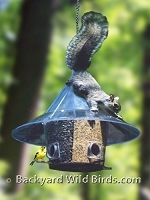 If you have a bird feeder that is going to be accessible to squirrels, use a Twirl A Squirrel to spin them off! Entertaining and great fun to watch! Need help? 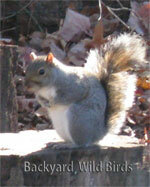 See our Bird feeder FAQ, placement tips and designs to have a Squirrel proof bird feeders. Large clear 20 in. dia. 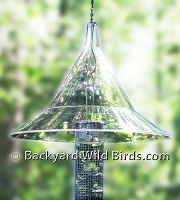 hanging Bird Feeder Squirrel Baffle. 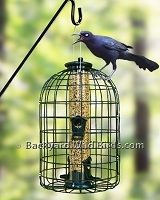 Excellent way to stop squirrel attacks from above and squirrel proof bird feeders. One of the very best, whether hanging from pole or tree branch! Bird Feeder Pole with 2 hanger arms and cylinder squirrel baffle made to squirrel proof bird feeders hung above it. Stops squirrels raiding bird feeders. 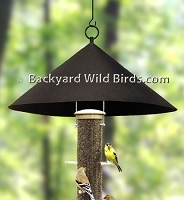 It comes with two bird feeder hanger arms, a black cylinder squirrel baffle and a twister ground socket. 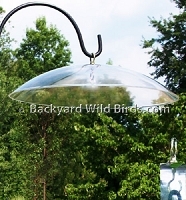 Squirrel Stopper Pro the ultimate bird feeder pole system is truly a squirrel stopper. 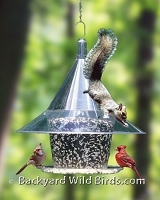 Large squirrel stopper baffle stops squirrels and raccoons making your bird feeders squirrel proof. 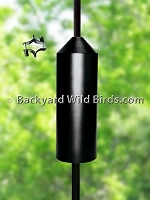 The Squirrel Stopper pole is very rugged with 8 hanger hooks.